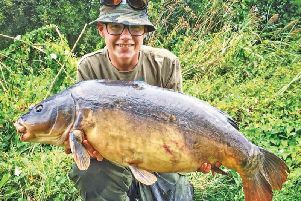 But die-hard Phil Mapp has kept stalking away throughout the drought and, as soon as some cloud came along he was into fish – two decent ones in two trips. Determination can pay...providing you know how to use your bread. WATERSIDES are no more immune from scumbags than our streets as hard-working MKAA bailiff Joanne Ridgway found out last week. She'd challenged two men stealing fish on Lodge when one slammed her against a tree, leaving her winded as he ran off with her bag and cash. Police investigating robbery with violence are looking for men of Eastern European appearance. Jo says she wasn't seriously injured, and the scrote who attacked her fell over and cracked his head open as he fled the scene...so there is some sort of natural justice! CARP are still feeding. 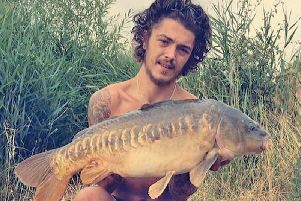 Kane Thompson has had another couple of nice Furzton fish, while Steve Lindop had eight runs producing fish to 19lb on Lodge as Tony Lawrence had the 'dark common' at 19. WITH fish under weather-related stress in many places last week, the Parks Trust used its 'weedy boat' to clear excess weed at Wolverton Mill, and had a pump-aerator on stand-by following a localised fish kill – the result of a massive algal bloom – in the bird sanctuary Tear Drop. Thank you Parks Trust. OLNEY's Ouse produced a 5-9 tench for Phil Lee. Towcester's Silver Lake saw Gilders Tackle lads Pete Dixon and Dan Todd catch 10 carp to 16lb in an evening. OSPREY, Lakeside: Ed Blane 112lb, Gareth Prince 45-10, Ken Sawyer 44-10. MK Vets, Brackley Lake: Paul Hamilton 27-15, Mick Wilson 19-12, Rob Gibson 15-8. TOWCESTER/Nene, Silver Lake: Ray Pottinger 18lb (three carp), Kevin Elliot 5-4, Chris Howard 5lb. NEWPORT, Abbey Pits: Dave Tebbutt 11-7, Barry Glidewell 5-3, Kevin Osborne 4-5. OLNEY, Ouse: Pete Harvey 6-2, Gordon Prince 2-10-8, Dave Partridge 1-10. CALVERT, Claydon Lake: Ron Hillier 5-4, Austin Maddock 5-2, John Weatherall 4-8. FURZTON Festival: Aug 22, Ken Ball (vets) 01908 565446; Aug 25 'float-only', Aug 27 Frank Swan open and Sept 14-16 carp open – GoneFishin 01908 313158. FIXTURES: Sunday, Furzton A, B & C closed for match; Tuesday, Olney Ouse open 01234 240061; Aug 10-12 Lodge closed for charity match.